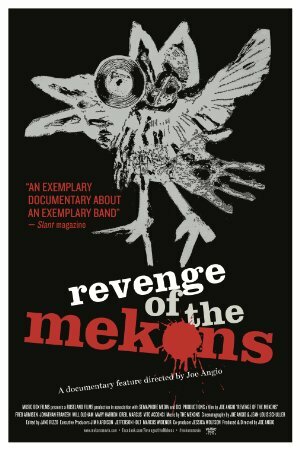 Revenge of the Mekons charts the unlikely career of the genre-defying collective notorious for being--as rock critic Greil Marcus notes--"the band that took punk ideology most seriously." This is a good doc about a great band, a bit conventional in style for a recounting of such a genre-defying, amorphous band, but they're charming enough that I loved it anyway. I don't know how anyone could spend 90 minutes with the Mekons without coming out of it loving them, not just as a band, not just as charming and talented people, but as a rollicking collective you wish you could somehow hang out with. The pervasive message of the film seems to be that yes, the Mekons have survived (and flourished) a long time without any commercial success, even as their lives have been busy and complicated... but they were never in it for the money, they've always taken time off when they needed it, and they always come back together, because they actually like each other. And it's that last part, as much as their undeniable talent, that has put them in the peculiar position of being a band that never got past a cult standing, but has maintained that cult without any apparent dropoff in enthusiasm, for roughly 40 years. I particularly like Greg Kot's description of their [insert your preferred nomenclature for alt.country, insurgent country, Americana, or whatever] years: that they tried to play American country music, but they got it so wrong it sounded like they had invented something new. OUTER SPACE IS A REALLY NICE PLACE!